Free use of social media across a whole company – it’s not a concept everybody agrees is productive. But where I work, it’s helping us to achieve some of our organisational values of openness, fairness, teamwork and flexibility. I speak about this very often with people interested in the approach taken where I work, Monmouthshire County Council, so I thought it might be easier to put my view of our experiences in one place. Here are links to descriptions about what made us decide to give staff access. 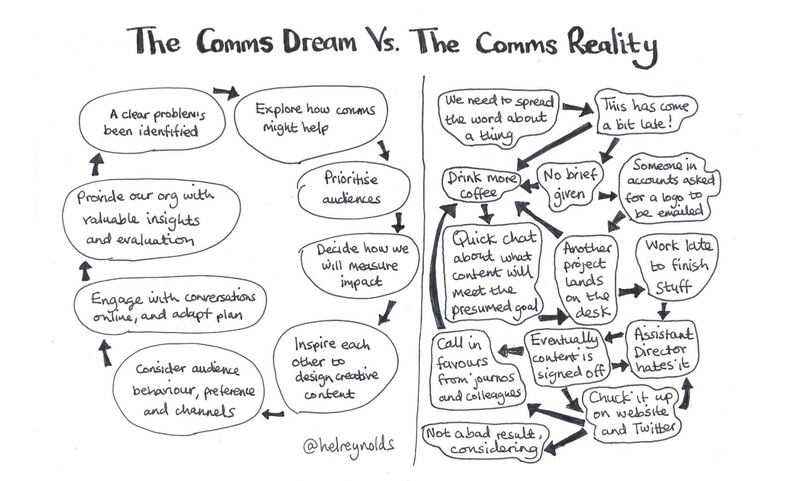 I’m lucky to work with a leadership team in Monmouthshire who are open to new ways to communicate, but not everyone has an easy job of getting buy-in. Hopefully this will help someone who wants to increase social media use where they work. Below is stuff that I might not have covered before on this blog but they are issues I’m regularly asked about. What happens when somebody says something they shouldn’t? What about digital exclusion/people without IT skills? What about the blurred lines between the professional and the personal? Are all staff tweeting then? Is this the death of PR? Councillor Peter Fox, council Leader talks about social media at a Participation Cymru event in Llandrindod Wells in 2012. I filmed this on my phone with a low battery which accounts for the abrupt ending! What social media is doing for us at Monmouthshire County Council – notes for this presentation are on SlideShare. The same as what always happened – a big fuss will occur, hopefully somebody will apologise and learn from their mistake. Social media has not seen the invention of mistakes – we’ve always made them and always will. But we do our best to understand that more people can misinterpret, be offended or cause mischief if they want to. This knowledge should help us think harder about what we say and do, and get better at what we do. Please remind me of this next time I make a blunder of some kind! They matter very much. We find ways to communicate with them in other ways – meetings, good customer service, communications via newsletters, posters and other traditional channels to reach people. Exclusion includes some people who don’t engage because they feel we’re boring. We have to make ourselves more relevant to people’s lives. Some people don’t have great internet access, some people can’t use IT – we’re working on improving that – we must help as much as we can. A tweet with leisure centre opening hours will never replace a sign on the door . But in my role, my focus is on the increasing number of people who are online and do want to talk to us that way. The number is growing and we have an increasingly mobile audience (stats on our website tell us that as well as general UK trends). Our progression online will not be to the detriment of the disenfranchised or offline people, and they currently have the same channels they always had. Social media is an extra until it doesn’t need to be. But I feel I must make sure we don’t forget the online people and make sure we give them what they need too. Well in my case, I make time. It a council’s job to listen and talk to residents so the services we deliver are right. I use free tools like Hootsuite, Google Alerts, Twitter lists and following local WordPress blogs and other things to keep track of what’s happening. But I don’t pretend that this is a slick monitoring system – it’s a way of keeping in touch with what’s happening and identifying if anybody might need help. There’s not enough activity yet to need to hurry getting a process for more social customer services right – that’s all to come. I encourage colleagues to use the channels they get most value from and to manage their commitment in small chunks of time and also to manage expectations about when they’re available and what can be done in that way. It’s fine for a departmental feed, like say leisure centres, to say they only check their feed and talk to people during opening hours. I’m not saying that we do everything brilliantly, we have a long way to go, lots of work to do and a limited amount of hours in the day. I think that trying to work this stuff out, experimenting and giving it a go – it’s better than doing nothing while we wait for a perfect process to come along. Where I work, this is up to the officer or member in question. Our social media guidelines (along with a general staff code of conduct and contractual obligations) give people a foundation for what is expected of them. Beyond that we try to make it clear in any training and support given that you must only post personal information online that you are comfortable sharing and which is appropriate. As an example, there are many people at work who keep online activities strictly about business, and some you’d never know work for the council who want to keep their activity personal and private. Others, like our Chief Executive, Leader or me, like to talk work and throw in some conversations on our personal profiles about our interests. For instance our Chief Exec will talk about his love for the Cardiff blues, the Leader often talks about life as a farmer and sometimes I like to talk about how brilliantly excellent Elvis Costello is. And we all have our own professional interests that we find people to share with and learn from. We know what is and isn’t appropriate but we also know that connecting with people to do our job can include a degree of small talk that makes our days a bit brighter and uncovers common interests we share with people. We do this whilst making sure we get the job done. No, that would be a bit weird. For now anyway. My colleagues who have an idea that they can gain knowledge, connect with residents, peers or experts or deliver a better service using social media are free to try it out. Their responsibility is to ensure it’s beneficial to their work or to the county as a whole and it must fit within their responsibilities as an employee. We trust people to use Facebook, Linkedin, Pinterest, Twitter and all sorts of other online tools to good effect and to effect good. It’s about listening effectively as well as talking. We don’t all have honed skills to effectively identify the right audience and have productive conversations. Even as someone who considers herself pretty good at PR, I’m making this stuff up as I go along, using instinct and life experience to find the right way to engage in a changing world where social media and local government are so rapidly changing. Anyone who has this stuff all sewn up should be running the whole country not working in PR in my opinion. My view is that people in PR have a more rewarding role in the pipeline – our love of language, talking to the right people and deepening trust – they’re skills we must share and develop across our organisations. As in-house teams, we’re not just the doers anymore – we are the in-house consultants, troubleshooters, advisors – leaning in and helping management teams with strategic insights (just like the awesome Grunig always said we should!). We will also help the front line experts – like carers, binmen, customer services people, park rangers – to connect with communities and be the real ambassadors and storytellers for what our organisations do. In the case of public servants, we’ll do our best to help our residents to talk to us and each other about what matters to them – and to be heard. We’ll provide evidence and evaluation helping our organisations to work better and be influential and useful. What we won’t be doing is trying to control everything, signing off all communication or believing that central corporate messaging is the answer to everything. Great blog – we often find the larger the organisation the bigger the fear. If a council can manage this then surely any organisation can! A great summary and useful links from a leader in this. Next Google Glass could make the world better – is social care going to be revolutionised?